There are innumerous pieces of Grecian pottery remaining today. They are most intriguing, and their various shapes and picture decorations are objects of appreciation and delight as well as of research. The paintings on the vessels are basically in black and red, and those with figures in red are called “red-figured”, and those with figures in black are called “black-figured”. The illustrated vessel is an example of Apulian pottery which was produced widely in Magna Graecia, the Greek colonies in southern Italy. Apulian vessels, which are red-figured, are characterized by decorations in added white and yellow pigments, and paintings involving the theme of human happiness or life and death. 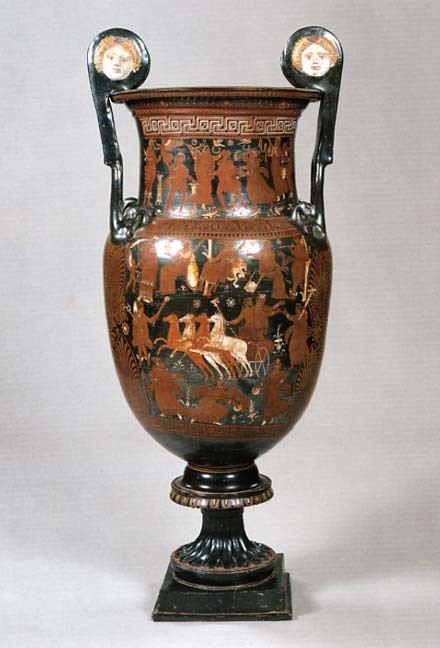 This vessel is in a shape called “krater”, which was used at banquets for mixing wine with water. However this particular piece is one of the monumental kraters used only in ritual context. The “Arpi Painter”, an important late Apulian painter, about whom recent excavations have uncovered, painted it. The picture in the front shows scene from the “Abduction of Persephone” from the Greek mythology. The upper portion which expresses Olympus, shows Aphrodite, Athena, Artemis, Apollon, and Hermes. On the backside are pictures on the body and neck, illustrating mourners visiting a grave, adding to the krater’s funereal appearance.